The statistics are made by Jost Jahn, Amrum, Germany, mpecs@jostjahn.de. They will be updated unattended about each 14 days or so. So if you notice errors, please contact me. A program downloads all MPECs from the MPC website and saves them, so that only the actual MPECs must be downloaded each update (to avoid traffic at the MPC). 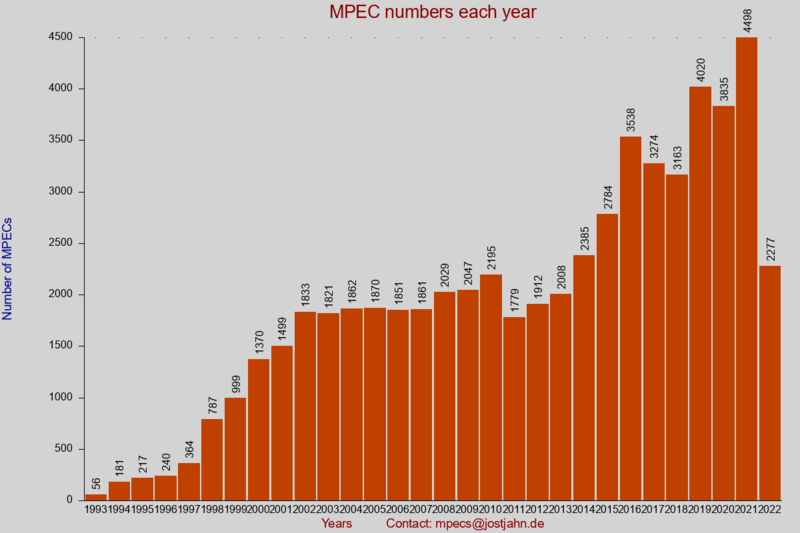 The program analyzes the MPECs and count them. Because the art of typing the observer name and especially the names of the measurer, it's difficult to get all of them from the text. If you miss some name or know, that a name was written in multiple modes, please contact me. The names of the measurers has not been well extracted from the MPECs, I work at the problem. The histograms were made using Gnuplot, so they will be also made unattended. The last year of the dataset is no extrapolation, so you can forget it. Station codes, sorted by number of all MPECs and normalized to all MPECS. 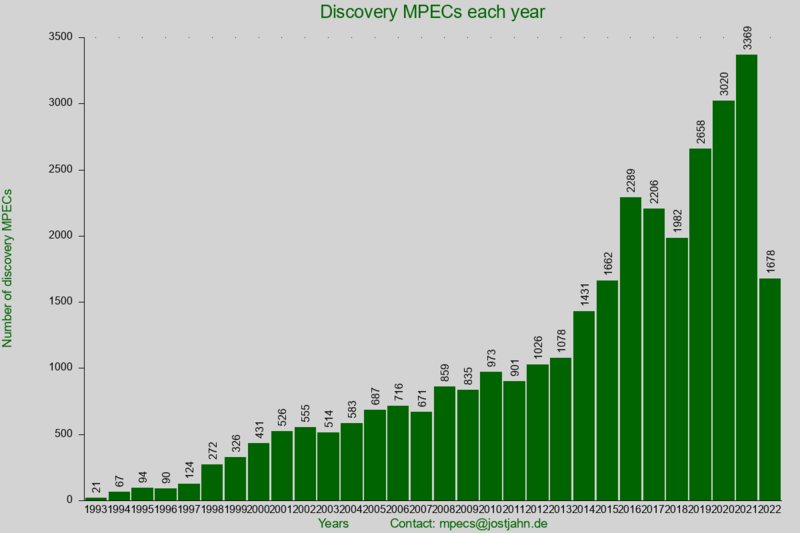 Some users asked to mark the "discovery" MPECs. I do this in one list above. A MPEC with a discovery have an asterisk at column 13 in the observation block(s). Sometimes this happens also in DAILY UPDATES or so. 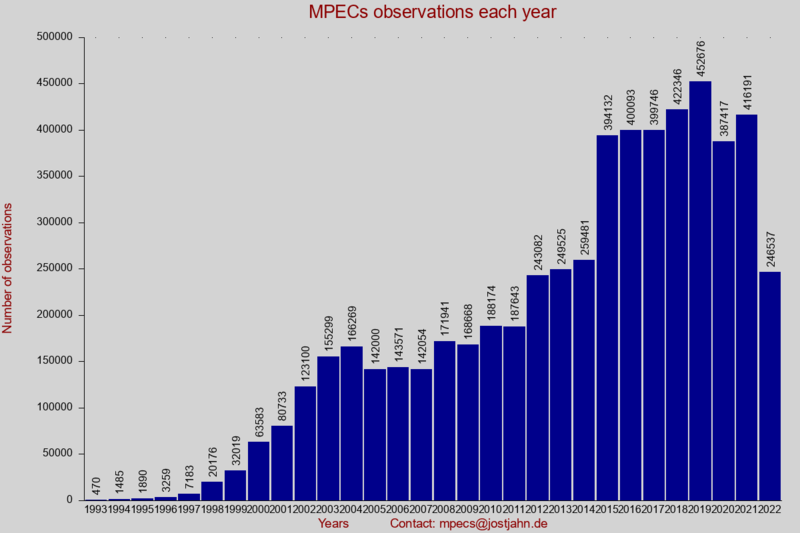 There may be some (but only a few) MPECs counted as "discovery" MPEC, which are only daily MPECs or so. If there is no measurer given, the observer will not be taken as measurer (may bechanged in future). Plans for future are calculation the apperent motion at discovery including elongation and distance to moon (and phase) and presenting those values in scatter diagrams. The 2019 introduced object count for each station will be updated by a yearly distribution including histograms and expanding them to the other statistic. If you want more values nd statistics, please ask. If you like these statistics and want to support me, use the Paypal donation button here or at the top right of the page. You can change the amount and the currency. Also smaller amounts are a support for my activities here and in the future.